1. APHA, AWWA (American Water Works Association), and WEF (Water Environment Federation). 2016. Standard Methods For Examination Of Water And Wastewater. 17 Edition. Disponible desde Internet en: https://www.standardmethods.org/ [Accessed in 07/08/16]. 2. BERNA, C.O. ; ORJUELA, G. 1992. Prospección arqueológica en el municipio de Turbana, departamento de Bolívar. Boletin Arqueol., 3. Presencia eds. Bogota-Colombia. Disponible desde Internet en: http://publicaciones.banrepcultural.org/index.php/fian/article/viewFile/5436/5693 [Accessed 07/08/16]. 3. BURGESS, B.A. ; LOHMANN, K.L. ; BLAKLEY, B.R. 2010. Excessive sulfate and poor water quality as a cause of sudden deaths and an outbreak of diarrhea in horses. Can. Vet. J. 51(3):277-282. 4. CALDERÓN, G.; SUAREZ, L. 2006. Caracterización bio- física del Arroyo Matute Turbaco – Bolívar. Teknos 3(1):35-42. Disponible desde Internet en: http://www.eumed.net/eve/resum/07-junio/ccse.htm [Accessed 07/08/16]. 5. CLEAN WATER TEAM –CWT-. 2004. Dissolved Oxygen Fact Sheet, FS-3.1.1.0(DO). in: The Clean Water Team Guidance Compendium for Watershed Monitoring and Assessment, Version 2.0. Division of Water Quality, California State Water Resources Control Board (SWRCB), Sacramento, CA. Disponible desde Internet en: http://www.waterboards.ca.gov/water_issues/programs/swamp/docs/cwt/guidance/3110en.pdf [Accessed 07/08/16]. 6. FISHER, L.S. ; MAYS, P.A. ; WYLIE, C.L. 2007. An overview of nitrogen critical loads for policy makers, stakeholders, and industries in the United States. Water Air Soil Poll. 179(1-4):3-18. 7. FONDRIEST ENVIRONMENTAL INC. 2016. Conductivity, Salinity & Total Dissolved Solids. 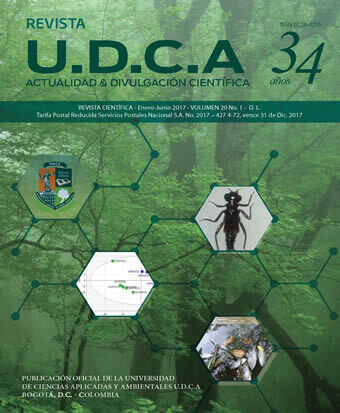 Disponible desde Internet en: http://www.fondriest.com/environmental-measurements/parameters/ water-quality/conductivity-salinity-tds/ [Accessed 07/08/16]. 8. INSTITUTO DE HIDROLOGÍA, METEOROLOGÍA Y ESTUDIOS AMBIENTALES DE COLOMBIA – IDEAM-. 2016. Disponible desde Internet en: http://www.ideam.gov.co/web/tiempo-y-clima/clima (Accessed 07/08/16). 9. MILLER, G.M. ; KROON, F.J.; METCALFE, S.; MUNDAY, P.L. 2015. Temperature is the evil twin: effects of increased temperature and ocean acidification on reproduction in a reef fish. Ecol. Appl. 25(3):603-620. 10. MINISTERIO DE SALUD –MINSALUD-. Colombia. 2016. Decreto 1594/84 Chapter IV and Decreto 475/98 Chapter III. Disponible desde Internet en: http://www.alcaldiabogota.gov.co/sisjur/normas/Norma1.jsp?i=18617 [Accessed 07/08/16]. 11. PATIL, P.N. ; SAWANT, D.V. ; DESHMUKH, R.N. 2012. Physico-chemical parameters for testing of water-A review. Int. J. Environ. Sci., 3(3):1194-1207. 12. WORLD HEALTH ORGANIZATION –WHO-. 2008. Guidelines for drinking-water quality: incorporating 1st and 2nd addenda, Vol. 1, Recommendations. 3 Ed. Geneva. Disponible desde Internet en: http://www.who.int/water_sanitation_health/dwq/fulltext.pdf [Accessed 07/08/16].